A comfortable, relaxing treatment with a typical sensation of warmth. No pain is experienced during the treatment. Inch loss varies from individual to individual. Generally a reduction of 4-6 inches is seen in the patient. At least, one to two dress-size reduction has been documented. A diet advised by us should be followed. An exercise routine also helps. If there is no weight gain, maintenance treatments are seldom required. Have 5 proper meals a day; it should be a balanced diet, with 5 portions of fruits and 2 portions of vegetables. Avoid missing meals. Cellulite is basically fat that changes compartments due to laxity in skin structure. This contributes to it getting stuck between the fibrotic bands in the skin, resulting in changes of irregular skin with dimpling, so it looks almost like an orange peel. The stimulatory action of Electro Cellulite Massager tones the muscles and reduces inches by improving circulation and lymphatic drainage, thereby breaking down fatty deposits. This is followed by the I-LIPO treatment. Independent clinical studies have shown that in some cases I-Lipo has similar results like liposuction. Ultrasound imagery shows up to 30% reduction in the fat layer depth after just one treatment. Additional treatments improve results further. Results can be seen immediately after each treatment as the fat cell contents are released. Light exercise post treatment can further accelerate the removal of the released fat. Compared to surgical liposuction, I-Lipo is much more affordable with similar results. 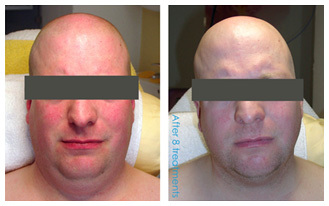 Results can be seen immediately after the treatment. Why Skin & You Clinic for Cellulite Treatment? At Skin & You Clinic, Mumbai, individualised treatment plans are formulated and combinations of treatments are carried out to achieve desired results.